Healthcare for the Cow Creek Band of Umpqua Tribe of Indians began in 1982 and consisted of primarily home health visits and the purchasing of outside services with CHS funds. The Urban Indian Clinic located in Portland Oregon also served to provide healthcare to tribal members who were in need of healthcare and not able to access it locally. The Cow Creek Health & Wellness Center (CCH&WC) first began operations in April 1999 with eight staff members; four clinical care staff (doctor, family nurse practitioner, nurse and receptionist) and four administrative staff (billing, CHS, CHR and Health Director). Over the course of a decade the CCH&WC has expanded both in employee number and services offered. The Tribal Administrative Office and Tribal Clinic building are housed in the same building of approximately 18,000 square feet. The clinic portion has four exam rooms, a reception area, and a small lab. The Cow Creek Band of Umpqua of Indians currently contracts health services. The Cow Creek health & Wellness Center employs: two physicians, one public health nurse, one clinic nurse, one psychologist, one CHR, and one dietitian. Tribal health programs include a Nesika Health Insurance Group and a Breast and Cervical Cancer Prevention Program. Medical services that are available include: general medical care, minor medical emergencies, comprehensive health physicals, sports & school physicals, DOT/CDL physicals, women’s & men’s health screenings, Well Child Care, diabetes screening & preventative care, family planning & counseling, nutrition services, weight management, and tobacco cessations. Also, a Diabetes Clinic is held once per month, by appointment. The total patient population is 519 (Contract Health). Since federal recognition in December 1982, the Cow Creeks have focused on promoting self – sufficiency for the Tribe and its members. Another difficult task has been educating the general public, including county and state governments, of the inherent sovereign rights and status of Tribal governments, as provided for in the US Constitution. After American settlers entered their area they signed a peace treaty, but many were forced into hostilities in 1855 and in the following years some were removed to the Grand Ronde Reservation, while others hid out in the hills. Descendants of this latter group form the core of the tribe today. The Cow Creek Band of Umpqua Indians occupied the watershed of the North and South Umpqua Rivers. After American settlers entered their area they signed a peace treaty, but many were forced into hostilities in 1855 and in the following years some were removed to the Grand Ronde Reservation, while others hid out in the hills. Descendants of this latter group form the core of the tribe today. In the winters, they resided in permanent lowland villages along Cow Creek, the South Umpqua, and Myrtle Creek. With the coming of summer, families moved to the high country along the Rogue Umpqua Divide. Here they established hunting camps for elk and deer, while women and children picked and preserved huckleberries and tanned hides. This tribe spoke Takelman, a language in the Takelman-Kalapuyan division of the Penutian language stock. Frances Johnson (Gewishwashan), the last fluent speaker of the language of the Cow Creeks, died in 1934. (1) Miwaleta Band who lived along the north bank of Cow Creek upstream to the vicinity of Cow Creek Falls. (2) Tara-gun-sau Band who lived on Council Creek and the south side of Cow Creek as well as along the South Umpqua River upstream from Canyonville. (3) Myrtle Creek Band who lived in the watershed of Myrtle Creek that flowed west into the South Umpqua River. (4) Wartahoo Band who lived in the upper Cow Creek Valley in the vicinity of Glendale, Azalea, and farther east. There is some evidence for a Northern Takelma dialect spoken along the upper Rogue in the vicinity of Prospect. Principal area industries include: lumber, agriculture, fishing, mining and recreation. The Cow Creeks signed the first gaming compact with the State of Oregon in 1992, and have proven a valuable asset to Southern Oregon. 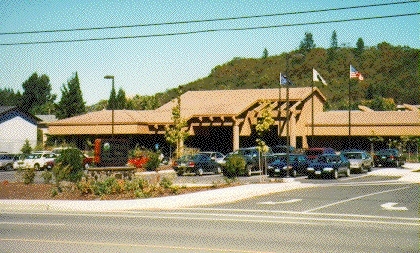 The Cow Creeks operate the Seven Feathers Hotel and Casino Resort in Canyonville, Oregon. The facility includes Nevada – style casino gaming, a 450 seat bingo hall, gift shop, twenty – four hour restaurant, lounge, sports bar, fine dining room, and other amenities. The 1500 seat Umpqua Grand Ballroom and Convention Center has hosted concerts, boxing and other area events. The adjoining four – star, 156 – room Seven Feathers Hotel offers an experience in elegance and taste comparable to the finest west coast hotels. The Cow Creeks have focused on business diversification by investing casino profits to purchase businesses such as the Seven Feathers Truck and Travel Center, three motels, a graphic design business, a telecommunication business, and a meat-processing business that primarily produces beef jerky. The Tribe also purchased a large beef/hay ranching operation. In addition, Cow Creek has purchased property located on Interstate 5. (Note: All acquired lands of the Tribe have been by purchase.) A primary go al of Cow Creek is to “help people help themselves.” The Tribe continually invests in educational, social, health-oriented, and charitable programs for the Tribe and local community. City: Roseburg, population 19,000. Elevation 479 feet. Incorporated in 1868. County: Douglas, population 96,000. 5,071 square miles. Rainfall: 33 inches per year.